I am a shopping addict. I have no problem admitting it. Shopping is my favorite past time, and for better or for worse I have formed a slight dependence on that shiny piece of plastic etched with my name. My debit and credit card get a better workout than I do as I swipe them here and there in an epic quest for the best deal. To say the least, I certainly know my way around a store, but when it comes to paying — one thing has always left me puzzled. Debit or credit? A simple question, sure. But why ask me when I clearly handed you my debit card? Does it matter? Am I paying more fees when I pick one or the other? Essentially no difference between the two for the buyer. Many credit products contain built-in fees, and a failure to read the fine print or understand what you’re signing up to when applying for new credit may impact you later on when you receive your bill. The payment mechanism is essentially the same, except your debit card draws from your Deposit Account versus from a credit card account, which is essentially a line of credit offered by your bank. So what this means for the cardholder is that the money is withdrawn immediately through the demand deposit account, while the charge could take a day to process through the line of credit. While the buyer often doesn’t see the difference between picking one or the other—there are different fees associated with using debit cards and credit cards. While the fees are in the hands of the retailers, debit cardholders aren’t always “risk-free” every time they swipe. The majority of fees that debit cardholders face are overdraft fees that in some cases can reach up to $35 every time a user swipes when there are lack of funds in a cheque or savings account. In addition to this fee, debit cardholders can also face point-of-sale fees that the bank can charge in certain transactions when pressing debit and using a pin verses pressing credit and signing on your purchase. This POS fee varies with banks so be sure to read the fine print before hitting that four-digit code. Now, with all forms of credit or banking there are always the risk of fraud that you should consider and be aware of when making your purchases, especially when it comes to buying online. When it comes to fraud with a debit card, the transactions made and money withdrawn is usually deemed a loss to the cardholder because it is automatically withdrawn from an account up until a stop has been placed on the card. This risk is reduced for credit cards, because the money isn’t withdrawn out-right and a stop can be put to the card before any money is paid. Well, I’m sticking with saying credit and signing my name. While my bank doesn’t charge POS fees, why risk it? Signing my name may take a few extra seconds and may come out looking like gibberish, but I’d rather not risk someone else finding out that crucial 4-digit code—and essentially putting a stop to my shopping habit for good. Is Your Credit Card Safe From Fraud? 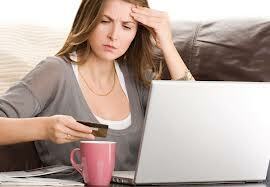 Credit Card Debt Making You Feel Depressed?